Published: Dec. 24, 2017 at 01:14 p.m.
New York Jets placekicker Chandler Catanzaro's 13-yard kick bounces and is recovered by the Jets. Published: Oct. 22, 2017 at 03:26 p.m.
New York Jets safety Marcus Maye intercepts Dolphins QB Matt Moore and has a big return. 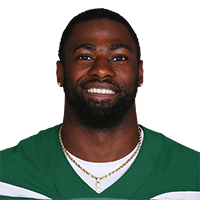 Published: Oct. 8, 2017 at 03:14 p.m.
New York Jets safety Marcus Maye makes his first career interception in Week 5 against the Cleveland Browns.